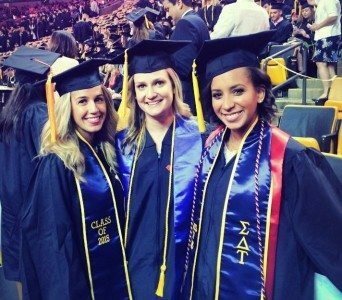 As an alumna of Sigma Delta Tau, you already know about the opportunities and friendships provided by membership, and we hope you’ll use this site as one of many ways to stay in touch. In the Alumnae section of this site, you’ll be able to read about our notable alumnae and featured alumnae, find ways to connect, recommend a potential member, register a legacy, and more. Whether you volunteer to serve as a chapter advisor, find and attend a local alumnae association meeting, or connect with an old friend through one of our social media tools, Sigma Delta Tau sisterhood doesn’t end with college. Participate in your region’s Sister’s Night Out or Alumnae Day of Service.